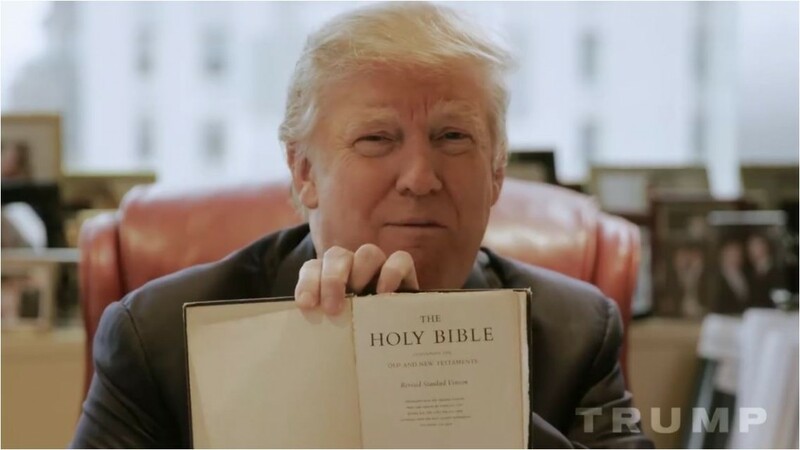 IOWA CITY, Iowa --- On the day before the Iowa caucuses, GOP presidential candidate Donald Trump is doing his best to appeal to voters who have been skeptical about his claims to be a Christian. His latest campaign promise is for a comprehensive Sunday Law. "You know me, I'll get it done," said Trump, waving his family Bible to an enthusiastic crowd in Iowa City. "Sunday Law will be YUGE!" Trump declined to offer specifics about the proposed Sunday legislation, promising instead that the new law would be "terrific" and that it would be "so good your head will spin." Probed by reporters on how Sunday legislation would affect religious minorities, Trump said that just as with his much-publicized calls to ban Muslims from entering the United States, he had to do what was right for the country. "We can't worry about what's politically correct if we are going to make America great again." While this story is satire and parody, maybe Trump really should make a Scripture-based campaign promise: to elucidate what the Bible says about adornment and salvation by grace through faith. How in the world did the Millerites get this wrong. Trump is the little horn of Daniel. Now the Trumpites will kill 7 Upers to get the 2nd coming back on track. OK he has to win the election, which shouldn’t be difficult since the devil is filling in for God who is employed 24 hpd in the heavenly cathedral trying to figure out who is sheep and who are goats. Yeah, persecution on the horizon! That’s why I married my three wives individually instead of as a group. My first wife, Ivana, was the toughest master of all. She stole the show in The First Wives Club with her signature line: “don’t get mad, get everything.” And she got it: a $25 Million divorce settlement before I married # 2 in 1992 and # 3 in 2005. I’m waiting till I become President to marry # 4, one of the White House interns. Did you know that Donald Trump’s name backwards is decoded as “666”? Upon my word of Honor! Woe izme!! Correct! Donald Tramp a/k/a Donald Dump is a blight upon our society. He should be whipped with a wet noodle. Then he should be deported to Miami. He should be forced to perform free labor, building the Great Wall of Mexico along with Sheriff Joe Arpaio of Maricopa County, Arizona, a big Trump supporter. They would make a wonderful chain gang. They would look almost as pitiful as the Women’s DUI Chain-Gang that Sheriff Joe initiated this week. All they need is a cattle-brander to tattoo “666” on their forehead! What a bunch of twisted sickos post on this. It’s not worth the time reading such trash. One of other forerunners to The Antichrist. I voted for this guy! Our alternative was clinton who is pro gays. Satan has his bases well covered doesn’t he?